A schematic for acquired photosynthesis, which can be represented with a mathematical model and tested in the laboratory. 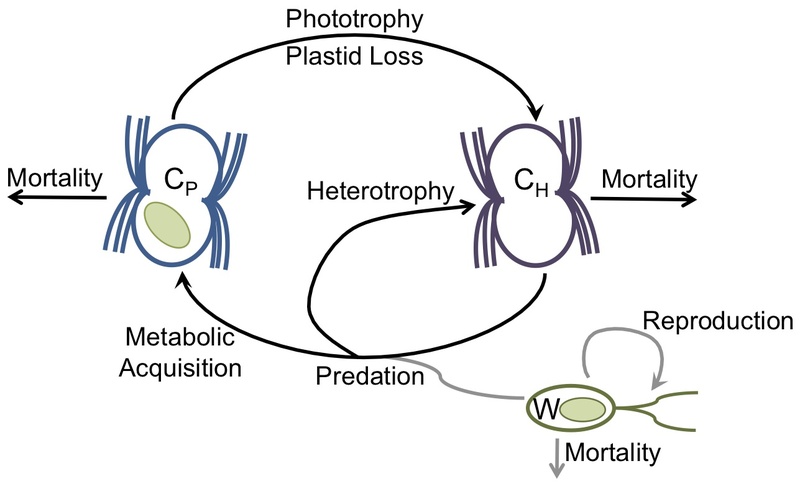 Acquired photosynthesis, in which an organism becomes a primary producer by stealing organelles or partnering with an autotrophic endosymbiont, can effectively transform planktonic community members from predators to competitors. I first became interested in this phenomenon as an undergraduate while working with Paul Falkowski at Rutgers University. In collaboration with Matt Johnson and Mike Neubert at WHOI, I’m developing and testing general theory describing the acquisition of photosynthesis. Ask me about our latest manuscript, which uses this theory to understand light-dependence and bloom dynamics in coastal planktonic communities! Mixotrophs (organisms that combine photosynthesis and heterotrophy) play a critical role in the surface ocean by coupling primary production and nutrient remineralization within a single cell. 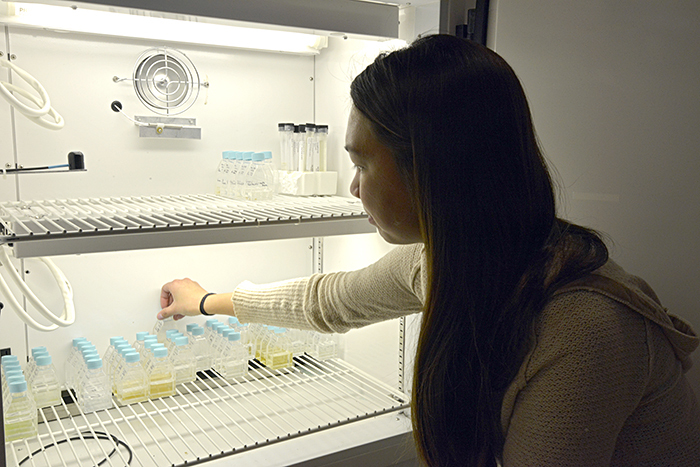 In collaboration with Matt Johnson and Mike Neubert at WHOI, I am studying how the persistence of mixotrophs in more complex communities that include metabolic “specialists” depends upon environmental conditions. I am specifically interested in how environmental heterogeneity (e.g., the frequency of light-dark switching, and the periodicity of nutrient supply) affect competitive outcomes. 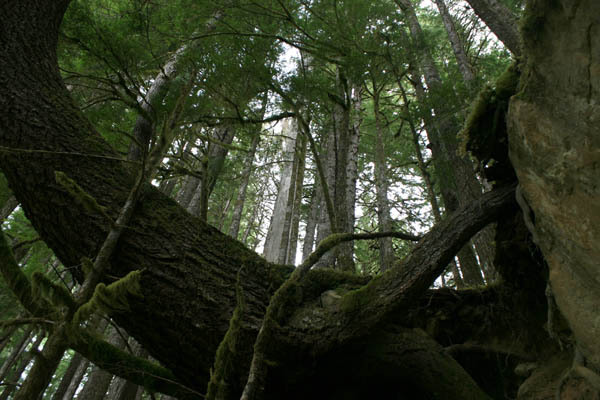 Towering Douglas-fir trees in Olympic National Park are supported by a huge belowground diversity of ectomycorrhizal fungal partners. While much mutualism theory has traditionally focused on pairwise interactions, in reality many mutualistic interactions involve guilds comprised of multiple species. How can we explain the persistence of such high levels of diversity? As a Ph.D. student, I focused in particular on the metabolic mutualism between trees and ectomycorrhizal fungi, which can involve simultaneous association of host trees with dozens of fungal species. I showed that fungal diversity can be affected by both abiotic and biotic processes at the landscape scale, can have implications for diversity, and can arise from optimal (though counterintuitive) investment by trees in low-quality partners. Which partner should I choose? Optimal control theory can help us understand how individuals choose among investments in mutualistic partners, in acquired metabolism, etc. As a theoretical ecologist, I have particular interests in novel applications of optimal control theory in biological systems. Working with Mike Neubert at WHOI, I use optimal control theory to develop general frameworks for marine reserve design: We’ve shown that profit-maximization can sometimes depend on putting the majority (up to 80%!) of species habitat into reserve. I am also interested in optimal control theory as a way to explore the upper boundaries evolutionary trajectories: As a Ph.D. student, I used an optimal investment framework to study how partner diversity might be maintained in a multispecies mutualism.